So what exactly are LiPo battery packs and what makes them so special? That's an excellent question and is the topic of the discussion "what is a LiPo battery?". 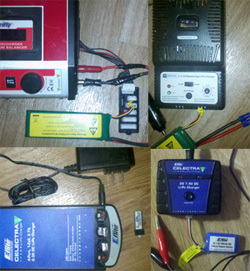 This page covers the actual use and care of Lipo packs. LiPo batteries aren't like other types of batteries you've used in the past. If you charge or discharge LiPo's too rapidly there's a good chance you will see some unexpected fireworks. It would definitely be a bad day if that happened inside your house or garage! And I'm pretty sure you've noticed these batteries aren't exactly cheap either. Aside from the safety aspect, there are a few things that are extremely important to know in order to get the full life and best performance from your LiPo battery packs. Each individual lithium polymer cell has a nominal voltage of 3.7 volts. Fully charged voltage is 4.2 volts. It is extremely important that a LiPo battery cell not be discharged below 3.0 volts or charged beyond 4.2 volts. Doing so will most certainly damage the battery! Electronic speed controllers (ESC's) designed for LiPo batteries have a Low Voltage Cutoff (LVC) that will automatically cut the power to the motor when the battery voltage (of an individual cell) reaches or nears 3.0 volts. For example, the lowest safe voltage for a 3s LiPo pack would be 9 volts. A 3s pack is simply three LiPo cells wired in series. If you're not familiar with what all the "s's and p's" on LiPo batteries mean, head on over to the discussion about lipo battery sizes. An RC LiPo battery pack is designed to deliver or discharge a maximum amount of current. This value is determined by the C rating of the battery. To determine the maximum allowed current, simply multiply the "C rating" by the capacity of the battery pack. Discharging a LiPo battery pack at a higher current than it's rated for is dangerous, not to mention it will drastically shorten the life of your battery. On the other hand... Having a battery that is too heavy for your airplane will make it fly like a slug. Striking that delicate balance between weight and capacity is crucial. Don't fret. 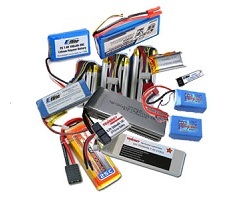 RTF and BNF RC airplanes come with the correct size battery already installed for you. The manuals for most all RC airplanes will tell you what size battery to use. 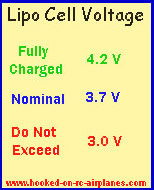 All LiPo cells have a nominal voltage of 3.7 volts regardless of their capacity. The voltage and the capacity of LiPo battery packs are determined by how the cells are wired together. Are the cells wired in parallel, series, or a combination of both? How the cells are wired together makes all the difference in the world! LiPo's are different than any other type of battery, so they must be charged with a charger specifically designed for LiPo batteries. Even with the correct type of charger, you could very easily wind up seeing those unwanted fireworks if you charge lipo batteries too quickly! By following the guidelines for LiPo battery charging you will get better performance from your LiPo batteries and they will last much longer. Most importantly, you will greatly reduce the chances (to nearly 0%) of having a fire that could destroy your home or injury your family. If horror stories about Lipo fires really have you stressed out, A123 batteries are more stable type of battery to consider. Unfortunately there were quite a few fires and destroyed homes when folks first began using LiPo battery packs with their RC airplanes. Mainly because they weren't educated and therefore failed to respect the dangers of LiPo's. LiPo batteries should most definitely be respected. But there's no reason to be afraid of them. 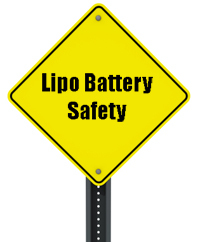 If you follow this advice on LiPo battery safety you will reduce the chances of an incident to near zero.